By the time you read this, hubby and I will be in the UP. We’re off the grid for the next few days, camping, hiking and exploring the great outdoors. But don’t worry. Sweet Sharing Monday will still go up, and I’ll be sure to share waterfall pics on my Facebook! We’ll be logging some major drive hours this vacation, and that got me thinking. Do you remember all of those pen and paper games we used to play as kids? From tic-tac-toe to MASH? I had a 45 minute bus ride for the majority of my years, so I was WELL versed in those sort of games. But, now that I’m older I know that if two adults play tic-tac-toe and come up with ANYTHING but a tie – one of them isn’t trying. Then, I came upon this version. Super Tic Tac Toe basically tic-tac-toe but played on 9 boards at once. AND – just to make it tricky – whatever square you choose to put your mark in dictates which board your opponent will play their next move in. That ends up adding a strategic element that is sure to keep even teenagers perplexed. So, I made a free printable in honor of our long trip. 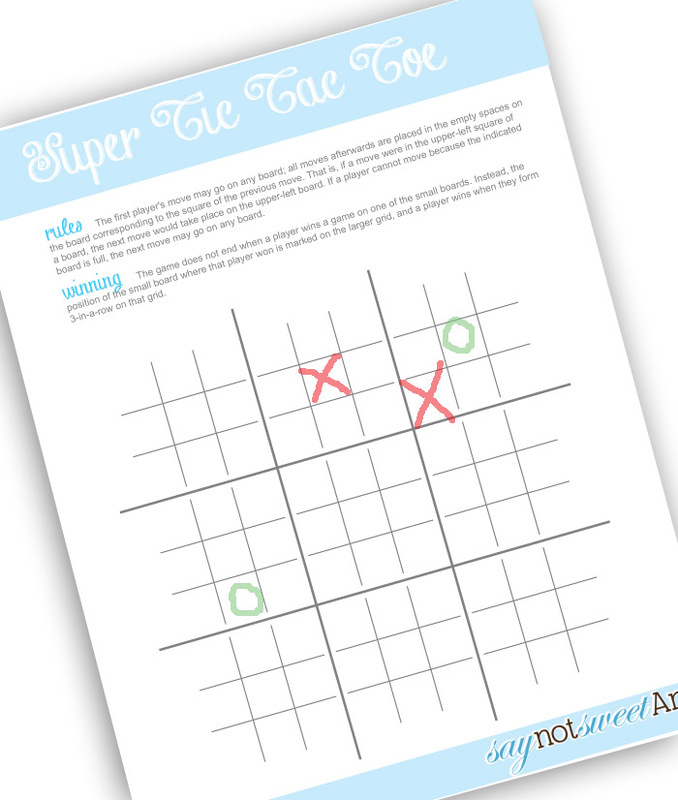 You can play it as Super Tic Tac Toe, or just 9 pre-done boards for the regular game, which makes it good for both adults and kids! Go ahead and print off a few and tuck them in the glove box. Its sure to keep you busy on YOUR next vacation trip! Oh boy. I love playing that game as a kid.